Jim Dine, My Tuxedo Makes an Impressive Blunt Edge to the Light, 1965. 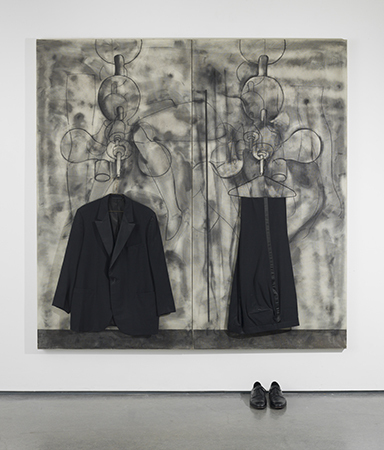 Oil, charcoal and tuxedo jacket and pants on wire hangers on canvas, with a pair of shoes below, 72 x 72 inches. Courtesy of the artist and Richard Gray Gallery. Photo: Adam Reich. Richard Gray Gallery is proud to announce two coordinated exhibitions of work by the acclaimed American artist Jim Dine. In Chicago, Looking at the Present examines Dine’s recent large-scale paintings. In New York, Primary Objects presents work from a formative period in Dine’s practice, focusing on his mixed material paintings and sculptures from 1961 through 1965. A two volume exhibition catalogue will document both exhibitions and will feature contributions by Hamza Walker, LAXART Executive Director and former Director of Education and Associate Curator at the Renaissance Society, and Michael Rooks, Wieland Family Curator of Modern and Contemporary Art at the High Museum of Art. Looking at the Present will inaugurate Richard Gray Gallery’s new converted warehouse space at 2044 West Carroll Avenue. The exhibition opens with a public reception for the artist on Friday, April 28 from 6 to 8pm. Looking at the Present reveals the development of new directions in Dine’s painting practice. Shedding the iconography of hearts, robes, and the Venus de Milo that has animated his visual language for decades, Dine’s recent work depicts elusive imagery that emerges and recedes in masses of layered, gestural marks. Some of the works step away from figurative depiction altogether, whereas others bring in fragments of the human body that coalesce and fragment amid a vividly pigmented compositions. In conjunction with Looking at the Present, the exhibition Primary Objects: Jim Dine in the 1960s at Richard Gray Gallery, New York examines Dine’s work from 1960 through 1965. It opens on Tuesday, May 2 with a public reception from 6 to 8pm. This exhibition focuses on a formative time in Jim Dine’s early career when his painting and drawing practice collided with everyday objects like crowbars, hammers, tuxedos, shower fixtures, lamps, and windows. Returning to the years immediately following his move to New York City in 1958, the exhibition illustrates the ways Dine incorporated household objects into his paintings and sculptures as extensions of and metaphors for the human body. Jim Dine (b. 1935, Cincinnati, Ohio) arrived in New York City in 1958 and rose quickly to prominence for his role in creating the first “Happenings” with Claes Oldenburg, Robert Whitman, Lucas Samaras and others. His extensive practice in painting, drawing, sculpting, and printmaking has been the subject of more than 300 solo exhibitions around the world, including ten major surveys and retrospectives since 1970. These include Albertina Museum, Vienna (2016); Frederik Meijer Gardens and Sculpture Park, Grand Rapids (2011); National Gallery of Art, Washington, D.C. (2001); Solomon R. Guggenheim Museum, New York (1999); Walker Art Center, Minneapolis (1984–85); and Whitney Museum of American Art, New York (1970). These exhibitions mark Dine’s eleventh and twelfth solo exhibitions with Richard Gray Gallery. Jim Dine has been exclusively represented by Richard Gray Gallery since 2016.